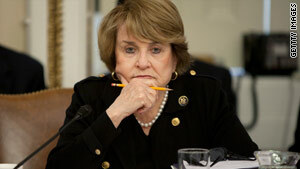 Democratic Rep. Louise Slaughter says her offices have received threatening phone calls, according to WHEC. (CNN) -- Democratic offices in at least three states have reported instances of vandalism that party members say possibly were tied to Sunday's historic vote on health care reform. Early Monday morning, a glass panel at the Tucson office of U.S. Rep. Gabrielle Giffords, D-Arizona, was shattered, spokesman C.J. Karamargin said. It wasn't clear how the window was shattered, but visitors have to go through a gated courtyard to enter the office, and staffers suspect someone may have shot a pellet gun at the glass, he said. Nothing was taken from the congresswoman's office, Karamargin said. Staffers had stayed late at the office the night before because of the health care vote, but had left before the incident, he added. The office has never experience anything like it since Giffords' staff occupied the office in January 2007, Karamargin said, adding that staffers believe the incident was linked to the health care vote in Washington. In upstate New York, two similar incidents were reported before Sunday night's vote, according to CNN affiliate WHEC. A brick was thrown through the window of the Monroe County Democratic Committee headquarters in Rochester, and another was tossed through a window of Democratic Rep. Louise Slaughter's office in Niagara Falls early Friday. WHEC reported that a note attached to the brick in the Monroe County office read "extremism in the defense of liberty is no vice" -- a quote delivered in an acceptance speech by Republican president candidate Barry Goldwater at the 1964 GOP convention. No one was injured in either incident in New York. Slaughter told WHEC that her offices have recently received threatening phone calls. Speaking on the House floor Sunday, Slaughter referred to damage at her office, saying, "The anger isn't just contained outside the Capitol. Last week someone hurled a brick through the window of my district office in the dark of night. We must step back to remind ourselves of why we are here." The House of Representatives on Sunday passed the sweeping $875 billion health care reform bill in a 219-212 vote. All 178 Republicans opposed it, along with 34 Democrats. Both Giffords and Slaughter supported the measure, though authorities investigating the incidents have not officially confirmed the link to the health care vote. Another incident was reported earlier in the weekend by the Sedgwick County Democratic Party in Kansas. Party Executive Director Lyndsey Stauble told CNN that a brick with anti-Obama and anti-health care messages was thrown at the headquarters sometime late Friday or early Saturday. Nothing was taken, and no one was injured, she said, adding that a bakery next door called police. Stauble mentioned that a recent post on a blog encouraged people to throw bricks at local Democratic offices nationwide. The Alabama-based blog, called "Sipsey Street Irregulars," says it has launched a "window war" against Democrats and has kept a tally of the recent incidents of damage, including the ones in New York and Kansas. Blogger Michael B. Vanderboegh of Pinson, Alabama, told CNN Monday that in a Friday blog -- which he says was posted after the incident at Slaughter's office -- he called for people to break windows at Democratic headquarters at the city and county level. He said he didn't call for the damages to congressional offices because, "I didn't want to be responsible for anybody breaking a federal law." However, "I can understand how someone can be frustrated enough to throw a brick through a congresswoman's window," Vanderboegh said. He said he feels the health care bill is "unconstitutional and tyrannical." "My answer is violence, by getting their attention," he said, adding, "If we can get across to the other side, that they are within inches of provoking a civil war in this country, then that's a good thing."